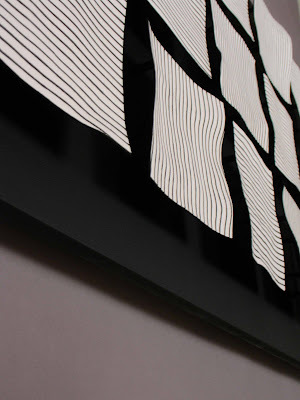 Synapse Artworks is the web presence of Brian Besch, an artist producing works in clay, screen-prints, and conceptually driven sculpture. Blank walls are lame. Instead of standing there awkwardly looking from your beer to that white splash of nothingness and back again, get yourself a nice work of art. It will cover up that nail hole and perhaps even fill that tiny, aching space in your heart. Sidle up to the new Etsy online storefront at http://www.synapseartworks.etsy.com and get your two-dimensional fix. This work is indicative of my testing the more conceptual waters again. The impetus for this work was an exploration of how the value of artworks are assessed, a process often contingent on seemingly shifting premises. I am also fascinated by how space is allocated to denote for us, "something important is within these boundaries." 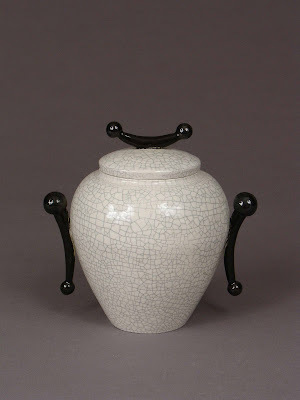 When we walk into the beaming white gallery space, it demands a near-reverential attitude, just as the frame or glass case indicates preciousness is contained within. This work toys with these notions from a base, materialistic perspective. Inside the case lie two porcelain tiles, each with frame-like features. 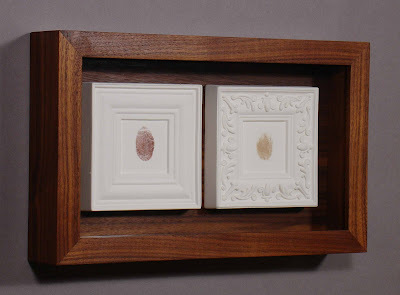 Thumb prints are centered in each, the right made in my own blood, the left in iron oxide. Materially, the pigments are identical: my blood is colored by iron. However, the process constituting the right tile is culturally loaded with notions of artistic romanticism as the artist literally puts blood, sweat, and tears into the artwork. The left tile might be viewed as mere facsimile, and thus does not deserve the aesthetic embellishment of the other tile. Responses to this work have been varied, and sometimes characterized as pretentious, but that is exactly what is being called into question. 12x7.25x2". 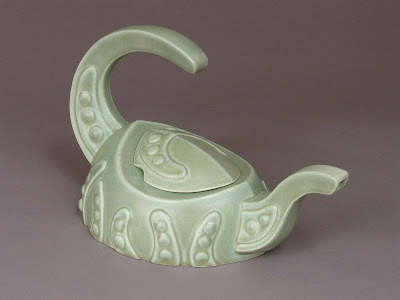 This is the last teapot mould I fabricated before leaving my studio space at UW-Madison. I enjoyed the engineering problems associated with creating a six-piece mould for the body along curved sides. 8x6.25x3.25"
These are three examples of the sake sets I made, all slip-cast porcelain. 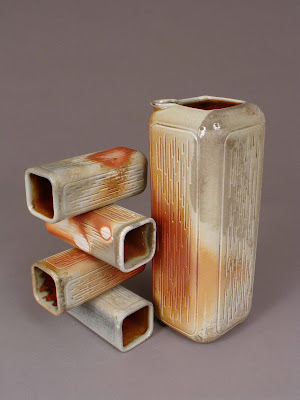 The wood-fired versions were fired in Michael Schael's anagama in Cambridge, WI, and the middle set was fired to cone 6 oxidation. These pieces were fabricated and carved in plaster, and proved an excellent lesson in exactly how finicky plaster can be when trying to take working moulds off a model. These moulds are no longer in production. Decanter: 8.5x3x3". Cup: 4.5x1.5x1.5". I created a simple pint cup mould to quickly cast the clay substrates needed for my foray into screen printing with clay experiments. 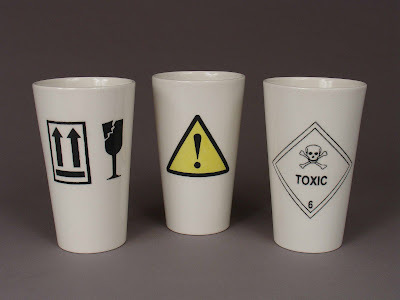 I did not want to use the traditional over-glaze decal method because of the toxicity of the overprint material, and the tendency for the images to wear off with extended use on functional ware. So, I attempted to create screen printing slips made with clay materials that could be used like underglaze and transferred, thereby allowing the image to be sealed under an impermeable clear overglaze. The results were mixed, and I have yet to be completely satisfied as the printed transfers generally require a fair amount of touch-up. Nevertheless, once I have the proper facilities at my disposal again, I intend to continue researching this process. 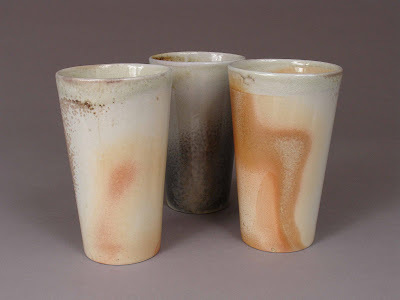 A few successful examples are shown here, along with some simple, stark wood-fired cups with shino liner glaze. 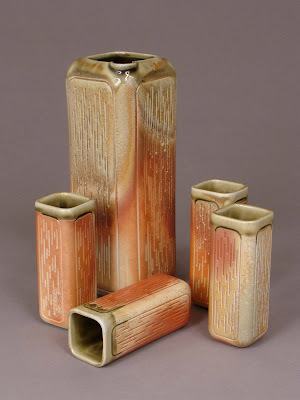 After graduating in 2003, I continued working at UW-Madison as a non-degree student, putting my more conceptual work on a back-burner for a mental breather, and returned to (semi) functional ceramics. I had dabbled informally in slip-casting, but saw amazing potential in this process, so I began researching it and honing my skills over the next couple years. 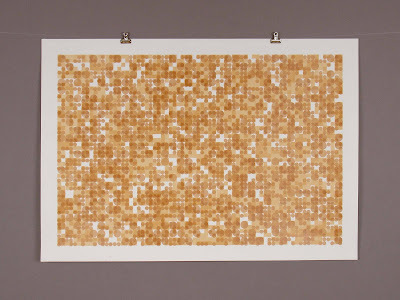 I liked the fact the artwork could appear in multiples, like screen prints. 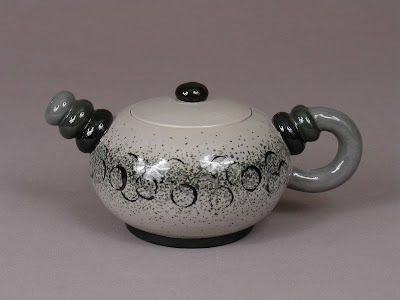 To me, it had the capacity to both reference the "lofty high-art" problems associated with metaphysically locating an artwork which has multiple instances, as well as the crass, kitschy production of low quality porcelain objects pop artists would appreciate. 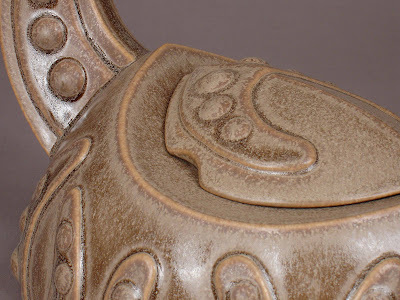 Slip-casting is now my preferred process in ceramics, and I feel that I have only begun to explore its possibilities. 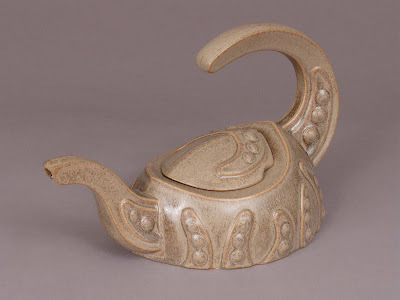 This is one of the first teapots I crafted to be slip-cast. 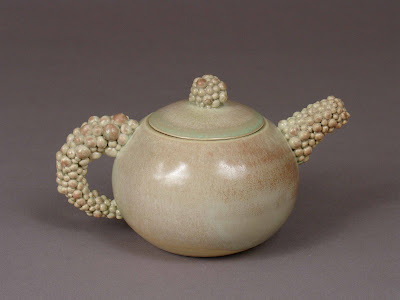 It was prototyped in clay using hand building techniques. These particular examples were fired to cone 6 in oxidation. 7x11x6.25"
I do few drawings anymore, but I executed this one as the first in what I hope to be a conceptual triptych about metaphysics. Prior to the production of this piece, I was blessed to have Terry Penner, professor emeritus of philosophy at UW-Madison, admit me into his final graduate seminar on Plato before retiring. The seminar focused on interpreting Plato's metaphysical theory in relation to modern language theory and how analytical philosophy is carried out in general. This seminar, and Penner's lectures overall, had a tremendous impact on how I view philosophy and art, and served as foundational springboards from which I have embarked on many conceptual works. For anyone who has studied Plato, you certainly have come across his Theory of Forms, a metaphysics in which beyond the particulars in the world there exist abstract objects, or "forms." These are thought to be more "real" than material objects, and exist behind and beyond physical objects, regardless of them. Nominalists, on the other hand, refuse to admit of any such entities, insisting all there is to what we call, for example, "orange," is all the particular orange things. We just use the term as a convention of language, but it refers to nothing. I am not advocating nominalism here, but it just happens to be the first in the series of drawings I choose to work on. I gathered orange drawing media - a pencil, cray-pa, pastel, pen, marker, and crayon to make the drawing. Since language is instrumental in the concept, I insisted on using products specifically labeled "orange." A number was assigned to each drawing media, and a dice was rolled to determine which item would be used to draw a freehand vertical line. The process was repeated until the page was filled. 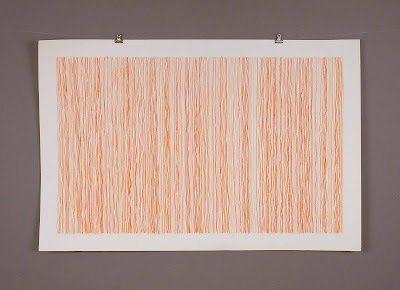 Through this piece, I wanted to reference this metaphysical debate and propose to the viewer to inquire whether each of these markings are a particular orange, or whether this can facilitate our seeing through the individual marks to what might be referred to as "orange itself." 25x38". 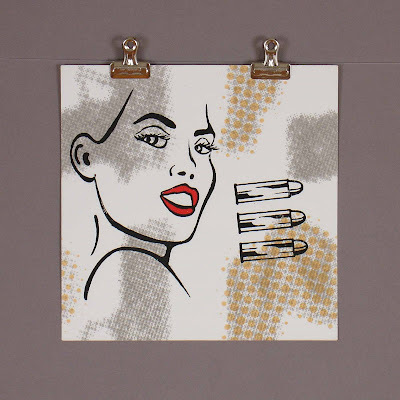 This print was completed with both a conceptual and technical goal in mind. The latter was to convince myself that I could still draw representationally, since I had not so in a long period of time. I was relieved to discover I still could. The former was an examination of the short prayer said during communion proceedings during Catholic mass. I am interested in how science has historically disenfranchised religion, and this print is meant to examine how spiritualism is being eroded by materialism. This work does not advocate either position, but rather serves as a reflection on personal history. 26x13", edition of 6. 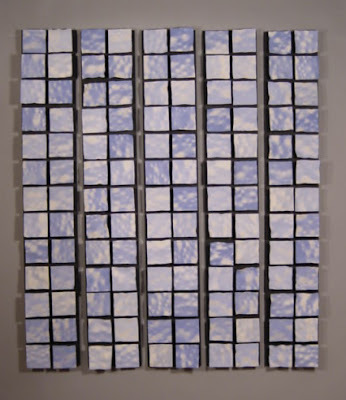 This piece is another aleatoric tile work, and an attempt to take advantage of the tendency of porcelain to warp during quick drying. 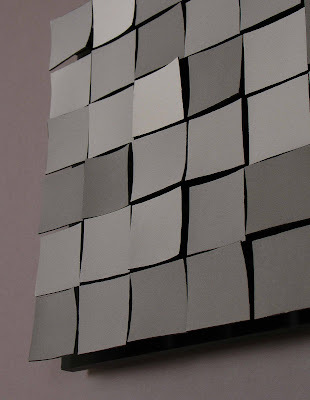 For this piece, porcelain tiles were again cut out and allowed to dry by the whims of the environment. Each tile was then striped using the linear curve created by warping on one of the four given sides of itself. The tiles were mounted on dowels, alternating the line position. I expected this piece to be Op-Art-ish, but I certainly did not foresee the extent to which it would be caffeinated and buzzed. Subtlety be damned with this one. Exact dimensions unknown, but about 24x36x5". Plainly and simply, my memory is terrible. I can barely remember last week, and I have to write everything down, making lists upon lists just to function in everyday life. 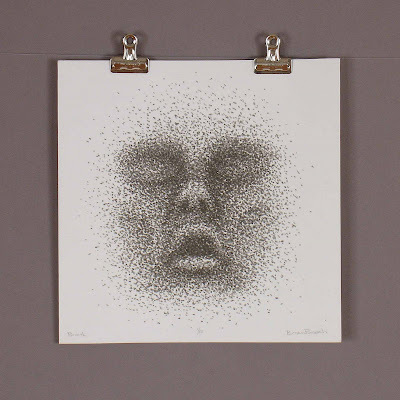 This print attempted to follow the subjectivity thread from the Cheeto print, but with an emphasis on the relativity of memory. While I wanted my prints to be mere documentations of a series of events I did not control, they were in actuality nothing of the sort. For instance, consider the percent error I likely attained in "documenting" the either/or coin flips 11,935 times in the print below. So this print is something of a confession and recognition of the element of human error, using a favorite childhood toy, Simon, as the medium. I played twenty games at the most difficult skill level, and as you can see, did not do well. Each game was recorded with the given light-ups in their respective orders. 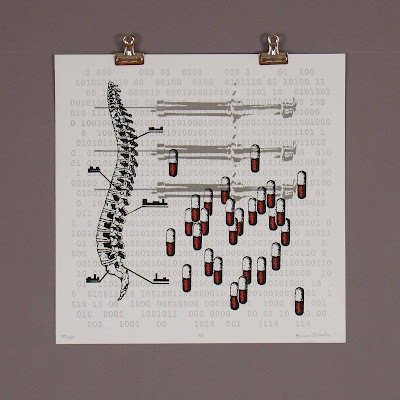 So, this print in a way memorializes both the effectiveness and shortcomings of memory. 19.75x30", edition of 6. 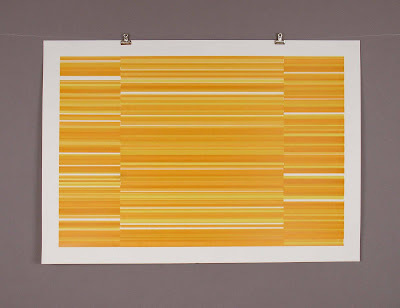 This print was a departure but also an extension of the abstract randomly generated work I was producing. After fabricating a fair number of the aforementioned prints, I began thinking more about the documentary nature of these works. To me, they had a very existential feel - the prints were merely the representations of a series of mundane events, and only referred back to their own processes and history. However, the same series of events could have been represented infinitely many ways. While we strive for objectivity in documentation, it is ultimately steeped in a subjective point of view, simply as a result of perspective, the limits of language, and our unavoidably separate consciousnesses. This may seem like excessive philosophical drivel over Cheetos, and it likely is, but I became fascinated with the mundane, completely benign elements of everyday life, and the subjectivity with which we approach them with. Consequently, I set out to create another random print, but to document something utterly pointless, elevating it to something gravely important through the absurd action of art-making. I bought a 13.5 ounce bag of Cheetos, and methodically removed each morsel, one by one, and traced it on a piece of paper. 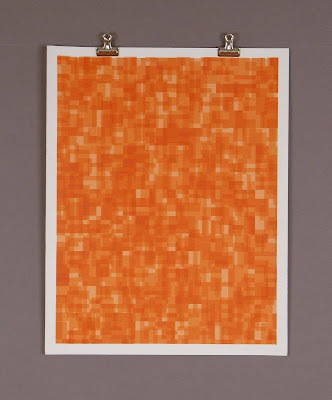 I then rated its cheesiness on a scale from 1 to 4, which is reflected by the colors in the print; the deeper the orange, the greater the cheesiness. 20x26", edition of 8. Unfortunately the lousy quality of this image really does not do this five-paneled tile piece justice, as the depth is completely indiscernible. 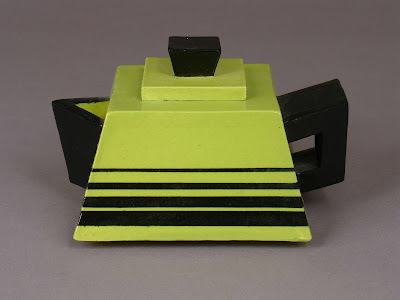 The chance processes in relation to ceramics are much more visceral than in the more abstract realm of screen printing, given the physicality and plasticity of the material. I attempted to take advantage this characteristic while executing this work. 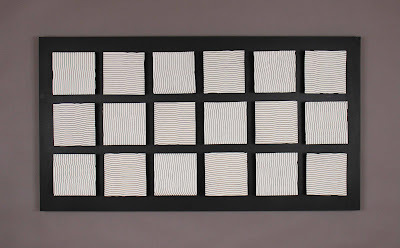 I assembled a small tray of various sized porcelain spheres I rolled and fired to harden. Thin porcelain tiles were rolled out and cut, and each tile was dropped from a height of a few feet atop the spheres, the still-plastic tile registering the impact. The tiles were then dried, sprayed with colored slip from the side to accentuate the bulbous forms, and mounted. There were many variables set up to arrive at this end object - the layout of the spheres, the color, direction of mounting, height of mounting, etc. I still have notebooks full of incomprehensible rows of numbers which are essentially the raw "code" from which this work came to be. 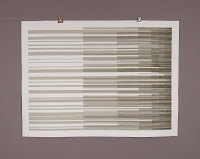 Dimensions variable depending on mounting, but about 48x48x6". I am a complete coffee junkie, and the nerdy title of this print reflects that. While standing over the finished print in the studio, waiting for it to dry, all I could see in this busy, jittery mess was little espresso molecules crashing around with little milk molecules, so I went with it. Slightly reminiscent of that great scene in the film Pi, where the cream is dumped into the cup of coffee. 21x30", edition of 4. 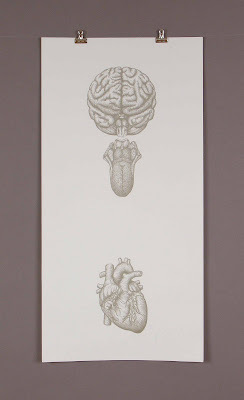 This diptych is meant to be displayed without blog text between each respective print, but you get the idea. 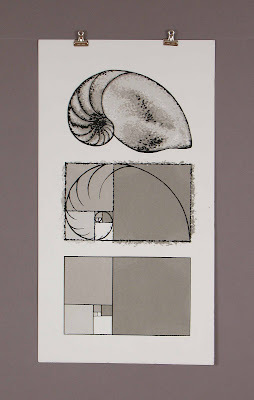 For this print, I used the Fibonacci sequence as a starting point, and drafted the print so the layers would gradually begin to saturate into a solid tone as it progressed further outward to the edges. 22x30" each, grey - edition of 2, green (not pictured) - edition of 4. 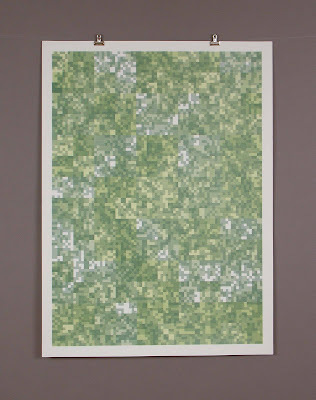 This work is in the same vein as the grey tile image below, but this time I randomly assigned given depths to the tiles during mounting. This piece is great to walk around in front of, as it seems to morph with each new vantage point. Unfortunately, it is fragile almost to the point of stupidity, as it is composed of paper thin tiles precariously perched on wooden dowels. The piece almost looks like a topographical map of some sort of mechanical forest. 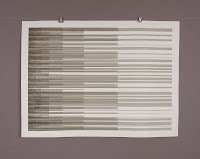 48x36x8"
These prints are aptly named, as there are literally 11,935 either/or events that led to image you see above. I began by drafting a grid of 4x4" squares, and using rubylith, flipped a coin to determine whether a given cell of rubylith would be peeled away from the positive or left intact. I did this in five layers, each time dividing the previous square into four new cells, the final layer consisting of 1/4" cubes. Knowing I wanted to print this during the fall semester, I began this work in the summer because it took nearly a month just to draft, and the fact that it didn't land me in a psych ward still amazes me. I ended up taking a set of quarters which I colored on one side with a black marker to make the faces more distinguishable, and scattering them across the floor, then recorded their pattern. I probably walked around for a month with tiny rubylith cubes stuck to my jeans and in my hair. I enjoy the fact that this print looks like it was drafted by a computer, or could have been, but was actually obsessively drafted by hand. While a machine could have burped out this image in a fraction of a second, I would never have had the chance to digest how the image unfolded, cell by cell, had I not spent hours staring at it. 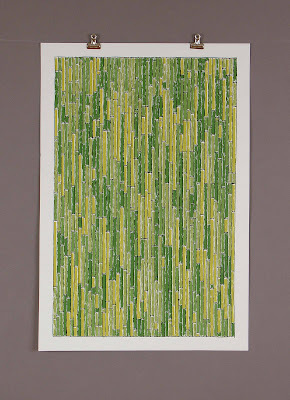 30x22", yellow/green - edition of 8, blue/grey - edition of 5. Every so often an artwork just seems to work effortlessly, and I feel this is the case with this print, which is still one of my favorites, and unfortunately, one I printed in a very small edition. Part of the attraction for me of working in the manner I did (drafting screen print positives by randomly cutting hundreds of pieces of rubylith) was that you never knew what was going to happen until you finally inked up the screen. These prints are methodically and fastidiously planned out, yet the end product is completely veiled until it is printed. 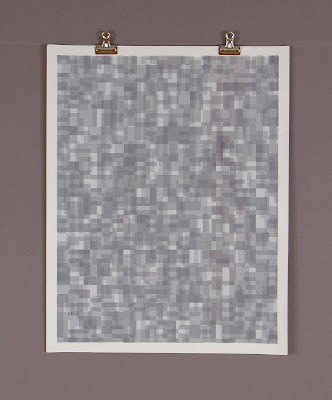 I often stood for several minutes examining how each ink run layered with the last, trying to understand how the print was built up to an incredibly complex image from only a few simple variables or parameters. 21x30", edition of 5. It was only a matter of time before the ideas I was developing with screen prints would bleed over into my mainstay - ceramics. This tile work was created by rolling out thin sheets of porcelain, about 1/16" thick, then cutting two-inch tiles from them. The tiles were left out on plaster slabs to dry, warp, and curl by whatever air currents or drafts were circulating about the room. 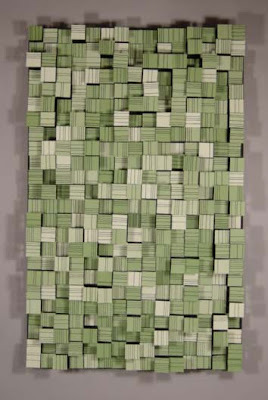 Each had a colored slip randomly assigned to it, and then the tiles were fired and mounted on a board using dowels to pull them off the surface for depth. 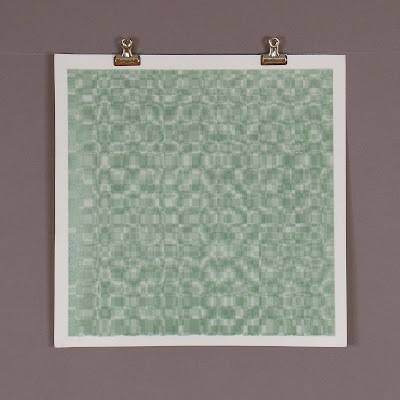 Part of the influence for these grid-like patterns stems from a research grant I received my senior year in college. 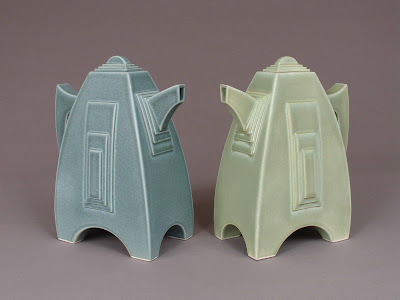 I was awarded a fellowship from the School of Education, which houses the art department at UW-Madison, to conduct technical research on porcelain and glazes. My entire work table was often covered with hundreds of tiny test-tiles, all composed of different porcelains, their respective ingredients and mineral compositions giving them subtly differing cream, white, and beige tones. I would often catch myself staring at these grids of tiles, thinking how mesmerizing and attractive they looked. So, eventually the test tiles morphed into finished works. 12x48x2". These two prints were drafted using the same positives, just different color runs. 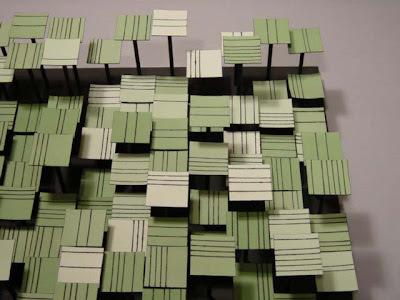 These were constructed by randomly drafting an asymmetrical grid on rubylith, scoring it, the flipping a coin to determine whether a cell of rubylith would be removed or remain. This process was conducted several time, then layered through printing. 14x11", blue - edition of 8, orange - edition of 9. 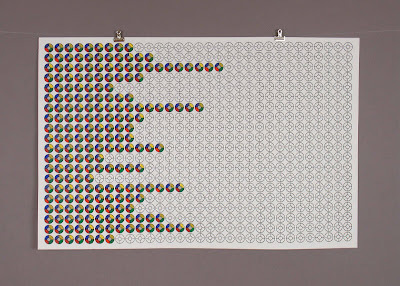 Another screen print drafted by chance - the color, and length of the cells were determined by tossing coins or rolling dice. This one was drafted by hand using photo-opaque markers on frosted mylar. 22x15", edition of 5. 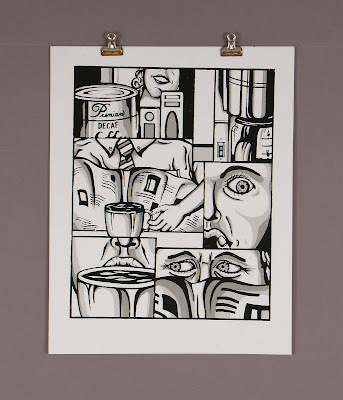 This print was done for a print exchange entitled "Whoops" and depicts a happy housewife accidentally making accursed decaf coffee for her husband. I was obviously looking at some tacky '50s illustration art at the time. 14x11", edition undetermined. 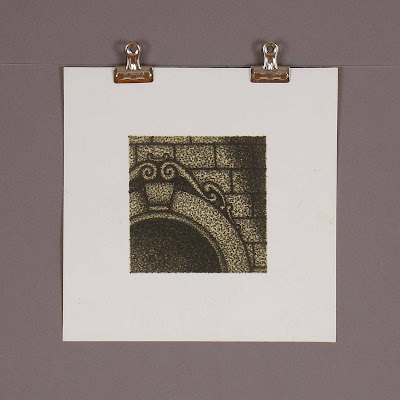 This set of three prints was the second endeavor using the aforementioned random process. (On a tangent, I feel the need to clarify that I use "random" loosely, as I'm in fact fairly skeptical about randomness. I suspect this is only a convention of language we use to frame the unknown, which has a specific causal history, but is, of course, unknown. Enough brash metaphysical claims though . . . ) Again, the prints were drafted by setting up a set of variables within a given range, and then seeing what would happen. The first print, which I don't really like, is an amalgamation of the other two. But hey, maybe this is how plaid was discovered. 7x22" each, edition of 4. This small, simple print deserves an explanation, as it had massive implications for me. 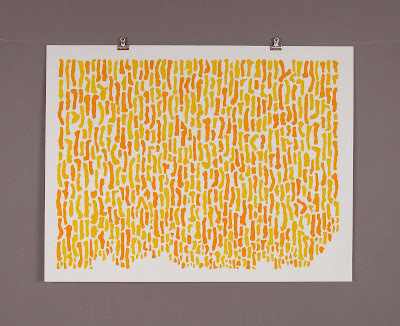 This print was conceived and executed at a time when I was beginning to approach language theory in philosophy, and I was constantly stewing, trying to understand exactly how meaning in language worked. I was also reading and ruminating about how an art object is to be distinguished from a so-called "real object." This mental toying prompted my questioning to what extent an artist has control over his/her work, and how are we to sort the deliberate from the arbitrary. We all know critics have written volumes into works of art, illuminating their murky depths for us, only to find out there was nothing there to begin with, or they were completely wide of the mark. Duchamp gave us readymades. Warhol used repetition until meaning was all but void. So, how does the true causal history of an artwork relate to its intention or alleged meaning? I had, and still have, no idea; but I set out to make work that was based heavily on documentation of an event, rather than trying to convey meanings. In this print, I assigned a grey tone to each number on a dice, set up a template, and drafted an artwork by chance. This process (which I would later find out was similar to John Cage's while composing music with the I-Ching) was heavily exploited in my later undergrad years in both prints and ceramics. This concept continues to linger in my artwork, and is an idea I wish to flesh out both aesthetically and philosophically in the future. 7x22", edition of 6. Again, a more political/punk rock take on the anatomy theme. I'm still fond of this print, one of the first I did. 11x30", edition of 10. I think I did this one to meet an end-of-the-semester print quota . . . 7x7", edition of 5. A more ethereal take on the anatomy influence. 11x30", edition of 4. 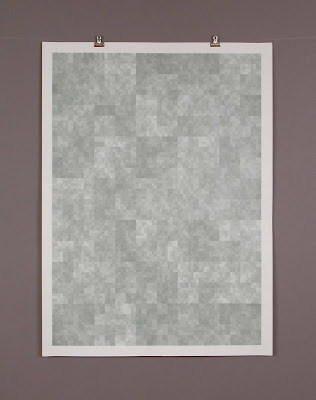 This is actually a tiled print, meant to be displayed with a minimum of four prints together (though there are 25). A little tribute to pop art and punk rock. 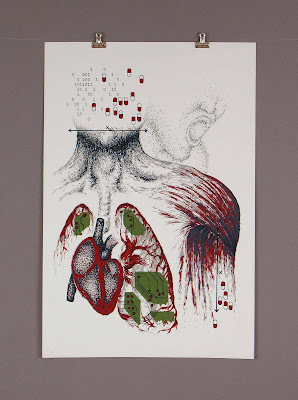 Another screen print drawing from a fascination with anatomy and medical illustration. 10x10", edition of 8. This screen print was executed around the time I started taking life-drawing courses. 22x14.75", edition of 5. 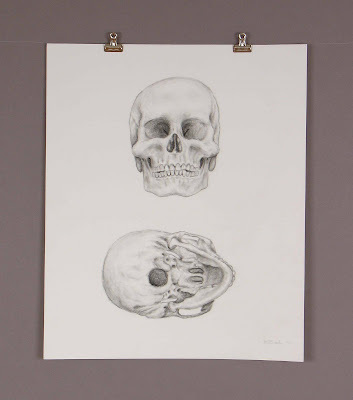 If skulls are what the kids want and think is hip these days, then skulls the kids shall have. 11x14". 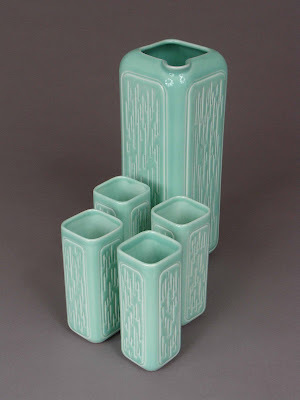 I am an artist in Salt Lake City (via Wisconsin) producing primarily ceramics and screen prints. I received a BFA and Philosophy Major from the University of Wisconsin-Madison. 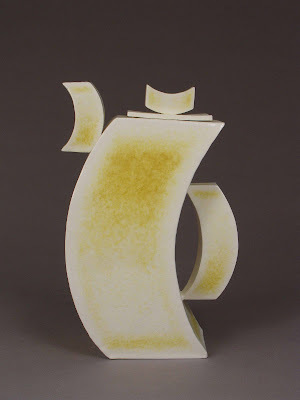 My fragmented output meanders from functional ceramics to aleatoric screen prints to more conceptual clay sculpture. Philosophy is my primary influence, and I am interested in the role of the intentional versus the arbitrary in a work of art. How an artwork is to be classified metaphysically, and its surrounding problems, provide yet another springboard for my output.